"We will not narrow any sidewalks or cut down any trees," a town of Brattleboro spokesman told the Valley Post. The announcement came after a packed public hearing before the select board on July 6. Dozens of citizens showed up to oppose the Dubie-Douglas scheme. “It was a poor choice,” Alice Charkes said of the Dubie-Douglas proposal. She lives in Brattleboro and is a director of the Vermont Bicycle and Pedestrian Coalition. One of Dubie-Douglas’s employees told the Brattleboro select board last month that the state would soon narrow some sidewalks on Main Street whether the town liked it or not. But some members of the select board – and more members of the public – put up a fight. Leading the fight for better and bigger sidewalks and bicycle paths in Vermont is John Ewing. He’s founder and board chair of a non-profit group called Smart Growth Vermont. Former governor Dr. Howard Dean appointed Ewing to serve on the Vermont Housing and Conservation Board (VHCB) which has played a key role in saving some 500,000 acres of farmland and forest land in Vermont from “development” in recent decades. VHCB also created hundreds of low-rent, energy efficient apartments in downtown Brattleboro and other Vermont towns. A graduate of Yale Law School, Ewing was president of the Bank of Vermont. In related news, on the afternoon of June 2, a car hit three people who were walking on a sidewalk in downtown Brattleboro. One of the walkers was taken to the hospital with a broken leg. Brattleboro police have the name of the driver but have not yet said if they will press charges. Rep. Virgina Milkey is a member of the state legislature from Brattleboro. "Isn't there something better we could spend our money on than narrowing the sidewalks?" she said. Milkey said that Brattleboro select board member Dora Bouboulis is gathering signatures on a petition opposing the Dubie-Douglas plan. 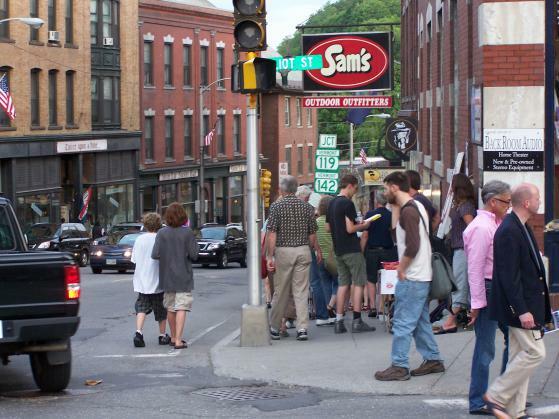 On June 5, Peter Shumlin told the Valley Post, "I will fight to ensure that Brattleboro's sidewalks are not narrowed." Shumlin is president of the Vermont senate and the only Democrat from the Brattleboro region who's running for governor. This photo of downtown Brattleboro was taken on June 4 by Eesha Williams. This article replaces a shorter version that was published on 6/30/2010. Submitted by Eesha Williams on Sun, 06/06/2010 - 09:21. "Dumb. We just spent a ton of money widening the sidewalks after they got narrowed 20 years ago to make more parking." Submitted by Anonymous on Sat, 06/05/2010 - 18:19. While many states and municipalities are adopting "Complete Streets" legislation, ensuring that all new and/or improved roads in their communities will be engineered to be usable by all types of users -- pedestrians, bicyclists, wheelchairs, and mass transit as well as cars -- Vermont's Gov. seems hopelessly mired in the last century when it was commonly accepted that streets only existed to server the automobile. Check out the National Complete Streets website at http://www.completestreets.org for useful information that may help mobilize elected officials in a more positive direction. Narrow sidewalks are particularly difficult for the disabled, which may provide some ammunition for fighting the plan to narrow the sidewalks. Submitted by Anonymous on Sat, 06/05/2010 - 16:28. This proposal is the exact opposite of what modern planing policy for live-able towns is. Sidewalks are supposed to be WIDENED. Cars "walked' (i.e slowed) through town centers. The idea is to promote pleasant walk-able public space, reduce sprawl, save energy. The Project for Public Space has a lot of information about how this works. Might someone show the Governor?